Lemongrass is an essential oil that wears many hats. For one, it can boost your spirits when you are feeling blue or it can work as a natural insect repellent if you are thinking about spending an evening outdoors. Whether you are new to essential oils or are just getting started, lemongrass essential oil is a must have for your collection. Lemongrass is the perfect scent if you want a bit of citrus without going overboard. This gentle essential oil has all the sweetness of lemon without the sour. Lemongrass itself is commonly used to flavor teas, deserts, and many other foods. Many like to use lemongrass when they want a less extreme version of lemon. The pure essence of lemongrass is captured via steam distillation of dried lemongrass. Lemongrass essential oil contains all the medicinal benefits of lemongrass itself, but is improved with the easy application of an oil. Lemongrass essential oil has many benefits thanks to its many medicinal properties. Listed are all the ways using lemongrass essential oil can benefit you and improve your health. Do you have a bottle of lemongrass essential oil in your medicine cabinet or first aid kit? If not, maybe you should consider it. Lemongrass is great at inhibiting the growth of bacteria both internally and externally. If you’ve sustained a wound or a burn, lemongrass essential oil helps speed up the healing process while preventing the injury from becoming infected. This powerful essential oil also helps prevent infections in the stomach, urinary tract, respiratory infection, stomach, and colon. Lemongrass essential oil is not only a powerful antibacterial, but it is also an effective antimicrobial agent, helping to treat the symptoms of food poisoning, typhoid, typhoid, skin diseases, and even body odor. As mentioned previously, lemongrass essential oil is great to have around when it comes to treated wounds. This antiseptic oil prevents wounds (external and internal) from becoming septic and resulting in worse problems. Lemongrass essential oil is such an effective antiseptic agent, that it is commonly found in many antiseptic creams and lotions. If you are suffering from a fungal infection, whether it is internal or external in nature, lemongrass essential oil has you covered. If you are suffering from such fungal infections as athlete’s foot, ringworm, and jock itch, lemongrass essential oil can help clear up the infection while soothing uncomfortable symptoms. If you are looking for a natural way to repel insects, lemongrass essential oil is worth a shot. Although there is no current scientific evidence on the type of insects lemongrass kills, it can be a natural alternative worth trying. If you are looking for a natural deodorant that does not have any potential side effects or doesn’t negatively affect the environment, lemongrass is a great alternative. This deodorizing oil eliminates odor-causing bacteria while leaving behind a sweet, citrusy scent. When diluted, lemongrass essential oil is a gently and effective deodorant that doesn’t irritate the skin or inflame certain allergies. Lemongrass essential oil’s astringent abilities can provide many benefits and uses. For example, lemongrass essential oil constricts the flow of blood and speeds up the clotting process, making it great to have on hand when someone is bleeding. This natural astringent also facilitates the tightening of the gums, hair follicles, pores of the skin, and muscles. This means that lemongrass essential oil helps to prevent hair and teeth from becoming loose and falling out while restricting blood flow in those who have issues with blood clotting. Lemongrass is a natural and healthy diuretic. When using lemongrass essential oil as a diuretic, it increases both the frequency and amount of urine. This is important because it not only helps to flush out toxins and excess water from your body, but it also helps to flush out excess fat. Studies have found that about 4% of urine is made up of fat, so the more you urinate, the more fat is lost. Regularly flushing out your system is also a great way to lower blood pressure, but it also helps to detoxify the kidneys as well. Lemongrass helps boost the production and quality of breast milk in that it is considered a galactogogue. Galactogogue is a substance that helps boost the production of breast milk in lactating mothers. Lemongrass’s natural antibacterial and antimicrobial abilities are integrated into the milk, helping to boost the baby’s immune system. Lemongrass essential oil helps to inspire natural perspiration, helping to bring a fever down. Increasing perspiration not only helps cool down and overheated body, but it also helps to sweat out toxins and whatever else may be causing infection. Lemongrass essential oil is also known to work on dangerously high fevers as well. For this purpose, lemongrass essential oil can be served in tea form to help those suffering from a very high fever. Gas is an unfortunate problem that we all have to deal with at one time or another. Fortunately, there are natural and easy ways you can help to remedy this embarrassing problem. Lemongrass essential oil helps to remove excess gas from the intestines. It also works as a great preventative measure, preventing gas from forming in the first place. Lemongrass helps to soothe an upset stomach or pain in the abdomen by relieving painful pressure. Often, when we are suffering from pain and inflammation, we turn to over-the-counter pain relievers and anti-inflammatories, which can have negative side effects on our health. Lemongrass essential oil provides natural pain relief, as is an effective anti-inflammatory. Those suffering from muscle pain will find soothing relief with this pain relieving oil. Athlete’s and those engaging strenuous exercise will want to keep this essential oil on hand. Lemongrass essential oil is also great for relieving pain associated with sore joints, toothaches, and headaches. If you are suffering from the flu, cold, cough, and chicken pox, this essential oil will help soothe uncomfortable and painful symptoms. This sunny essential oil will help boost the mood of those suffering from the blues or those who just need a little boost. Lemongrass essential oil helps to brighten the spirits while helping to bolster your inner spirit. Many find that taking lemongrass with their tea is an easy way alleviate symptoms of depression and remedy the effects of a bad day. This soothing essential oil works in multiple ways to soothe and calm you. For once, it soothes an unquiet mind and calms shaky nerves. Meanwhile, the anti-inflammatory properties relieve tension and anxiety while helping those suffering from insomnia. Lemongrass essential oil also has a sedative effect on upset skin, helping to reduce inflammation and itching. 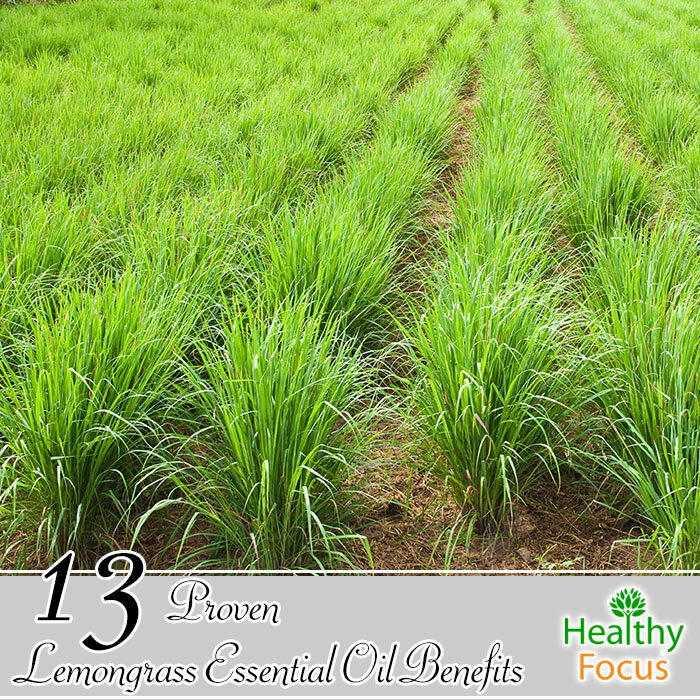 Lemongrass essential oil has so many health benefits that it is no surprise that it also has a wide array of uses. Listed are some of the recipes you can use to incorporate lemongrass essential oil into your healthcare routine and to treat a wide range of ailments. Lemongrass essential oil is a great way to improve the health of your scalp and to promote hair growth. When combined with lavender and rosemary essential oils, you will not only stimulate the hair follicles, but also improve the strength and health of your hair. Combine 3 drops of lemongrass essential oil with 3 drops of lavender essential oil, 3 drops of rosemary essential oil, and 3 tablespoons of raw olive oil. Massage this mixture into your scalp and then wrap your head with a hot towel. Let sit for 30 minutes and then wash your hair with a gentle shampoo. Lemongrass essential oil works as an effective face cleanser because not only does it help to clear up the acne-causing bacteria, but it also absorbs dirt and excess oil. Mix a couple drops of lemongrass essential oil with some warm water and apply directly to areas infected with acne after cleansing. To use lemongrass essential oil as an astringent, dip a cotton ball in diluted lemongrass essential oil and dab across your face. This will help shrink pores, eliminate bacteria, and provides a protective barrier on your skin, protecting you from harmful toxins floating around the atmosphere. Lemongrass essential oil contains vitamin A, which promotes skin renewal while helping to prevent scars from forming. Rich in vitamin E, lemongrass essential oil also helps to lighten up scars leftover from previous breakouts. If you are looking for an all-natural deodorant that not only eliminates odor-causing bacteria, but also smells great, consider using lemongrass essential oil as a deodorant. In a 4-ounce spray bottle, mix 10 drops of lemongrass essential oil with some witch hazel. Spray under your arms whenever you need odor protection. Lemongrass essential oil not only smells great, but it also makes a great all-purpose cleaner for the home. Mix 10 drops of lemongrass essential oil with some water and spray and wipe on any surface that needs cleaning. This solution works great on furniture and even windows. Even better, lemongrass works as a great insect repellant, helping to keep bugs out of the home. If you want an all natural way to clean your floors that will not only bust bacteria but smell great as well, try using lemongrass essential oil. Combine 1/4th cup of distilled white vinegar with a quart of water. Add 10 drops of lemongrass essential oil and stir the mixture so everything is evenly distributed. Apply this effective cleaning agent to the floor with a mop. After moping the floor with the cleaning solution, rinse the mop with clean water. Some research has found that lemongrass essential oil may be able to help dissolve cellulite deposits. Add a couple drops to your favorite carrier oil and massage directly onto any area containing cellulite. This remedy is also great for soothing achy muscles and sore joints. Lemongrass essential oil is a natural antibacterial and anti-inflammatory, meaning it can help with the digestion process while killing any bacteria that may negatively effect the process. Add a drop or two of lemongrass essential will help aid in digestion while alleviating symptoms associated with excess gas, stomach pains, nausea, and diarrhea. If your cholesterol is on the higher end of the spectrum, taking lemongrass essential oil can help get things under control. Lemongrass essential oil is great for your health because it reduces inflammation, fortifies the immune system, and contains the terpenoids geraniol and citral, which are compounds known to reduce the cholesterol. Mix a couple drops of lemongrass essential oil in a glass of water and drink everyday to help keep your cholesterol in control. Lemongrass essential oil not only works well on its own, but also blends well with other essential oils to not only create dynamic scent combinations, but to also benefit the health in a number of other ways. If you are looking to double the abilities of lemongrass essential oil, consider blending it with cedar wood, basil, geranium, lavender, jasmine, tea tree, and coriander essential oils. Lemongrass essential oil is one of the few essential oils actually deemed safe to use while pregnant and breastfeeding. However, it should be noted that essential oils are not deemed safe to use during the first trimester, as they can cause uterine contractions, affecting the development of your baby. Therefore, the use of essential oils deemed safe during pregnancy should only be used during the third trimester, when your baby is more developed. As it turns out, lemongrass essential oil is also safe to use on your four-legged friend. Some people find that using a small amount of therapy grade lemongrass essential oil is effective in tick control when blended with cedar scented essential oil. The gentle citrus scent may be pleasant to us, but it naturally repels insects while nourishing your dog’s skin and coat.